Our Story | Why Greyscale? 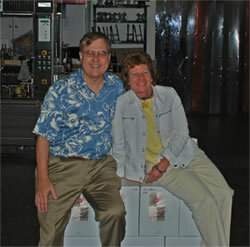 Greyscale Wines LLC is a family-run winery founded in 2009 by Jean and Larry Rowe. We specialize in Bordeaux-style wines. Our Cuvée Blanc is a new world take on a Bordeaux Blanc that blends barrel-fermented Sauvignon Blanc with Semillon which produces a rich, complex wine with many layers of flavor. Our Napa Cabernet Sauvignon is a blend of Cabernet Sauvignon, Merlot, and Cabernet Franc, which produces a classic California Cabernet that is similar to a left-bank Bordeaux Rouge. The origins of Greyscale Wines goes back a long way. Jean grew up in Northern California in a home with a backyard vineyard where her father grew grapes and made wine for many decades. She vividly remembers working in the vineyard to train grape canes in the Spring and taking refractometer readings at harvest. Larry’s interest in wine started as a consumer. He and Jean visited many wineries in California and around the world as they learned more about fine wines. The art of winemaking and marketing of fine wines was an obvious interest for Larry with his scientific background (Emeritus Professor in Computer Science at U.C. Berkeley) and his experience as a high tech entrepreneur (Co-founder of the original Ingres Corporation). A memorable trip to Bordeaux in September 2005 included visits to several Grand Cru Chateaux and witness to the harvest of the outstanding 2005 vintage. Jean and Larry decided after this trip to make wine that mirrored the great wines they enjoyed. We loved the elegant, low alcohol wines from Bordeaux. We also believe the best wines pair well with the fresh local food pioneered in California. Our dream is to create elegant Bordeaux-style wine using California grapes. We contacted a custom crush operation in San Francisco (Crushpad) to help us realize this dream. We met Kian Tavakoli who, besides having French heritage and sharing our love of Bordeaux-style wines, is a world-class winemaker. He trained at the world renowned U.C. Davis viticulture and enology program, interned at wineries in California and France, and worked at Opus and Clos du Val. We first made a barrel of Cabernet for private consumption in 2006 using grapes from the Stagecoach vineyard in Napa. We loved the wine and were sorry we could not sell it to friends who asked to purchase bottles after they tasted it. So, we decided to “go commercial” with our first vintage in 2008 – and Greyscale Wines was born. Our first release was the 2008 Cuvée Blanc that won a “Best in Class” award among Bordeaux White Varieties at the 2011 San Francisco Wine Competition. Both our 2008 and 2009 Cabernets have garnered Double Gold medals from distinguised competitons. The 2009 Cabernet was awarded 96 points by Tasting.com. The 2010 Cabernet followed suit with Gold medals from both the San Francisco Chronicle & San Francisco International Wine Competitions. In 2012, we joined the Kito Wine consortium and currently make our wine in St. Helena. We are happy to have Kian continue to serve as winemaker as we move forward. Many people ask why we chose this name for the winery. “Greyscale” is a term used in color science, printing, photography, and computer displays. It describes all shades of grey in the color spectrum between black and white. Winemaking, like many things in life, is not an absolute recipe (i.e., black and white). Instead each year's blending process involves a series of adjustments, reacting to the unique qualities of the fruit that year.